One Legal — As a new user, how do I join my firm’s One Legal account? As a new user, how do I join my firm’s One Legal account? 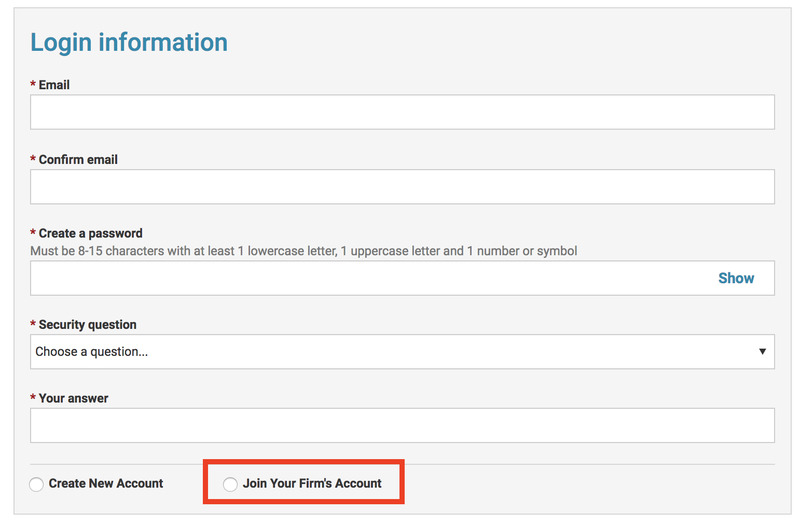 If you are new user registering for a One Legal account, you can join your firm’s account by following the steps in this article. Another option is to have the firm’s administrator add you. From the One Legal website, click the Create an Account button in the upper right-hand corner. Enter your email address, create a password, select and answer your security question, then choose Join Your Firm’s Account. Enter your firm's Customer Number and Billing Zip Code, then click Verify Account. Here's how to find your firm's customer number and billing zip code. Note: if you select Attorney as your job role, you are required to enter a Bar number and State of record. Be sure to do this if you want to be available for selection as the filing attorney when placing an order. Finally, you are prompted to read and agree to the Terms of Service. Once you’ve done that, click Create Account and your registration will be complete.